How about a swivel gun or two for those pesky pirates? I am joking in a way because I tried to do a few of them a while ago for my "Requin" xebec and in the end gave up. A friend had them made for me by a jeweler in Ukraine. I want to make swivel guns. The easy ones will be just a flat shape cut to form with a nice texture to show the details. And then I hope to make some scratchbuilt ones out of toothpick and stripes of paper. Have to see how they will turn out. Nice thing about your build is the cost of supplies. I do use paper on my models. Period ships had their lower masts bound with metal hoops. Seventeenth century they used rope wooldings. If you look in your "Historic Ships" book you will see what I mean. I use paper strips blackened with felt marker and then cut into strips 2 mm. wide, and glued around the mast at intervals. It's surprisingly tough and easier than working with metal . Yes, the building cost is a little more affordable compared to a wood model But remember these are meant for gaming and should be a little cheaper. 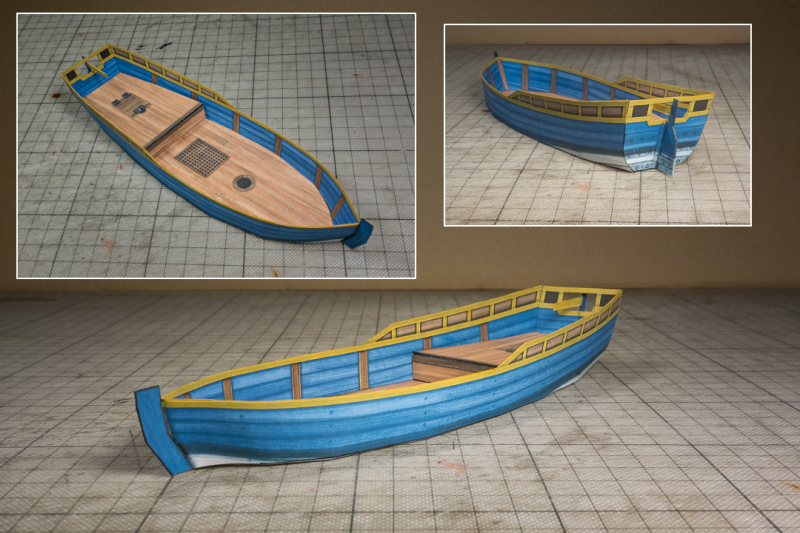 One bonus of the paper model choice is that you can build a whole fleet of (even different looking) vessels very fast and easy. A full wood model on the other hand to me is so much more worth than just the material cost. It's a treasure! It's art!!! Speaking of the different looks. Here is how I implement that. 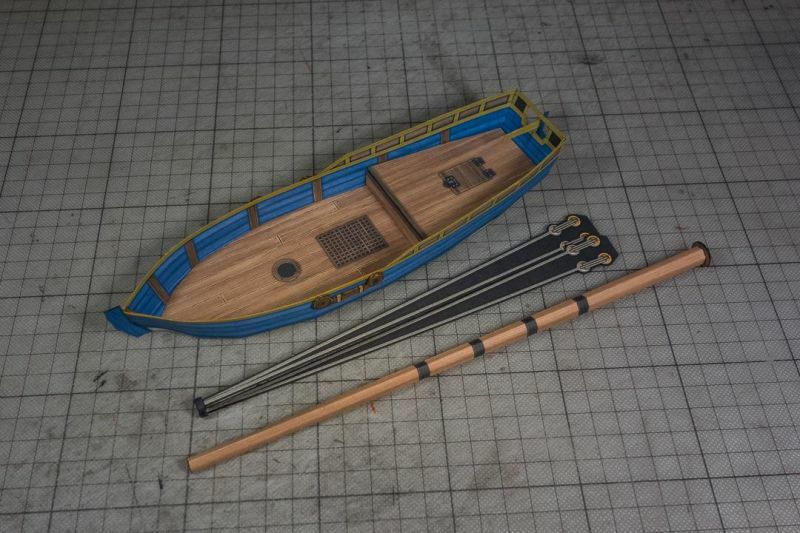 The boat comes in two basic looks or skins. 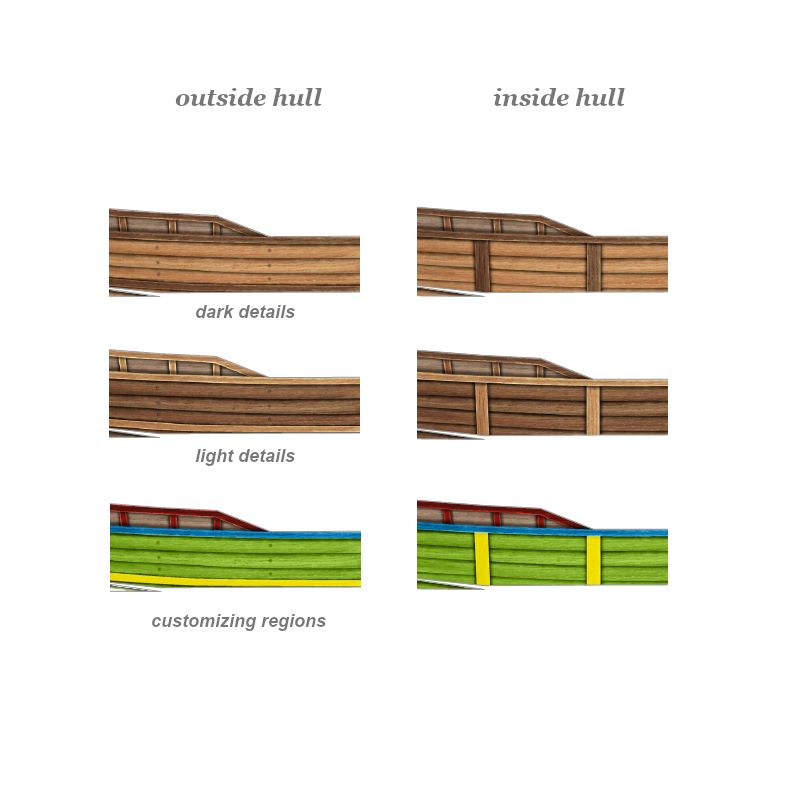 One is a light wood hull with dark "details" and another is the opposite. But then you can change the color of the different section before you print. 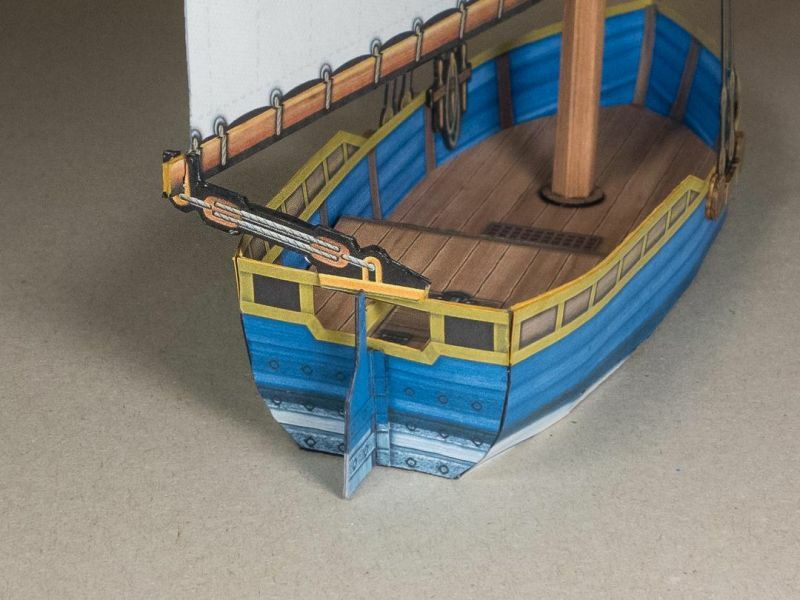 So today I show you a "blue hull" build with yellow details on the top and a white bottom hull (below the waterline). I have also started to add optional details to the deck, to make it look more interesting. Keith, I am actually adding the black rope lines on the mast. I am in the process of building a first so I will have pics to show soon. 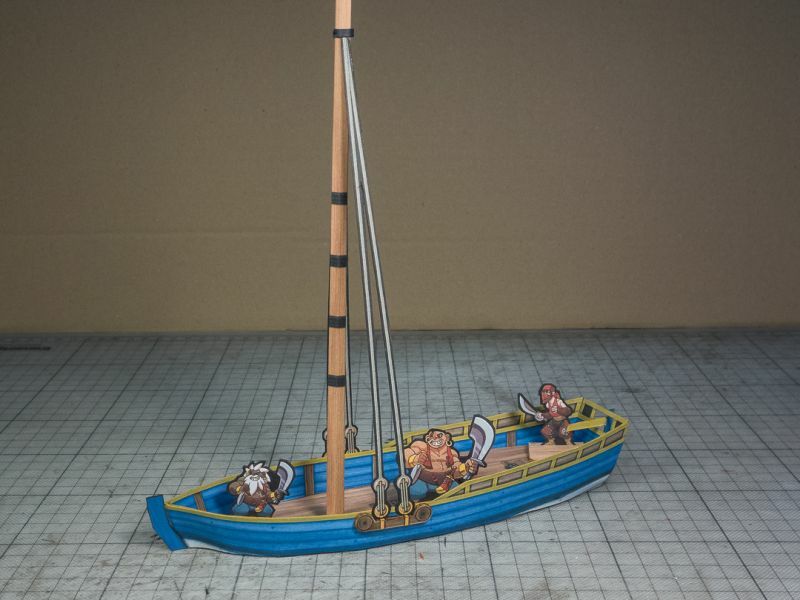 Here is a look at the mast and the simple ratlines textured. The first pic is showing a detailed cut of the ratlines. With the other I just cut the outline. And then you can see the diassembled parts. 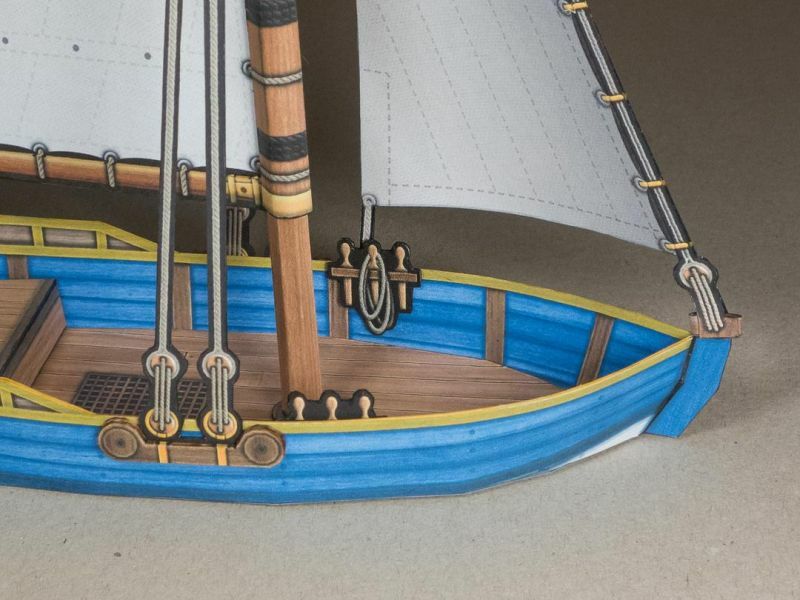 Now I am looking forward to texturing the sails! It's a brand I have used since I was a kid: UHU (yellow with black logo). Sometimes I use white glue for special areas. But you have to be careful not to use too much on paper, as it is quite wet and will warp if you don't press it to dry. I have finished the sails! I tried to add all the important details to the rig. 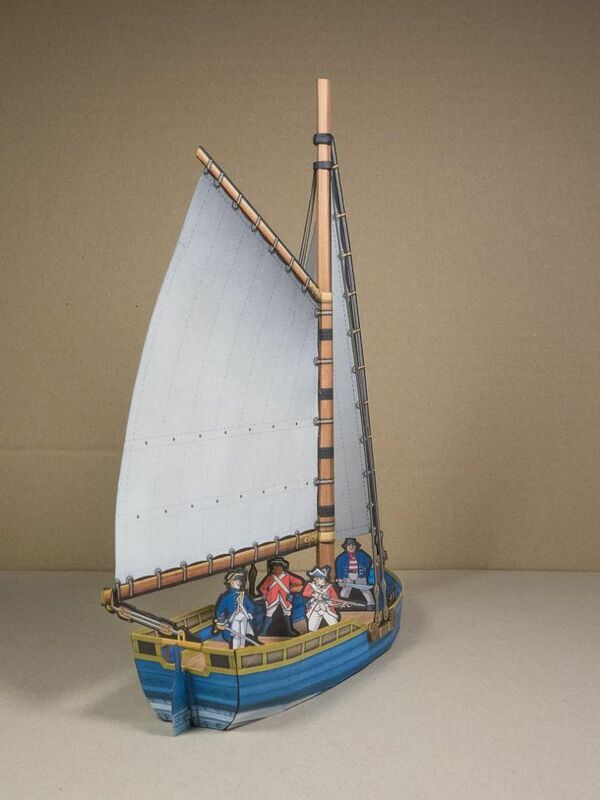 I have even added details to hold the sails in position. 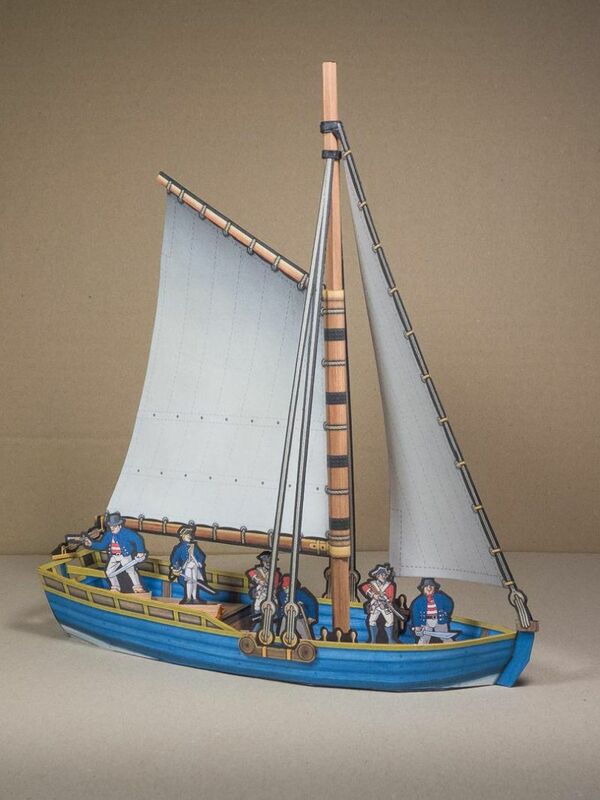 For the forsail I have added pins that have a slotspace where you can insert the forsail rope. 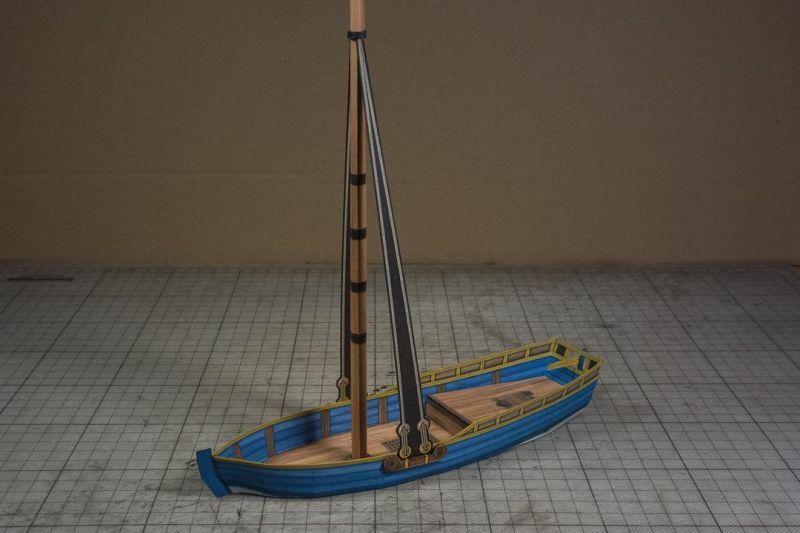 And for the main sail, I have added a mainsheet part that connects to the boom. A cut throat bunch of swabs if ever there was one! Now tell me briefly please, I know nothing about gaming, how do you use them? And aren't they somewhat fragile?